The Baton Rouge Unit of the Herb Society of America is creating a beautiful historic ethnic herb garden at the Burden Center. The Burden estate was donated to Louisiana State University by the Burden family to remain a green space in the middle of Baton Rouge forever. It is used by the LSU School of Agriculture for test plots for new and improved crops and for bee research; it also houses an All-American rose garden, a notable collection of camellias, a Children’s Garden, a Pollinator Garden, and many other things. The Burden Center herb garden will be a teaching garden next to the Children’s Garden. It will feature the culinary and medicinal herbs of the original inhabitants of this area and the herbs of the early settlers from Europe and Africa. It is a public garden and will be seen and used by many visitors, groups, and school classes. It will have four garden plots in a row. The first area, now complete, is a Louisiana kitchen garden called Flavors of Louisiana. In the second phase, we will have a pavilion and gardens with herbs used by Native Americans and African immigrants. In the third phase, a formal, symmetrical garden with plants used by the Spanish, French, German, English, and Italian early settlers to the Baton Rouge area will be created, and the fourth phase will be the creation of a natural garden with winding paths and native herbs. Each of the four sections will have paths, fences, beds, etc. appropriate to the ethnicities and times of the garden. It will also be a therapeutic garden, completely accessible to the mobility impaired, with packed gravel paths easy for wheelchairs to negotiate, and with benches and a pavilion so visitors can rest. Visitors can touch, taste, and smell the plants. It will be a beautiful place. What exactly is a therapeutic herb garden? We know from the scientific literature that spending time in a garden positively affects emotions and the sense of well-being. Access to nature balances our circadian rhythms, lowers blood pressure, lowers stress levels, and increases absorption of Vitamin D. Therapeutic gardens are increasingly being created around hospitals, as they are designed to improve physical, intellectual, emotional, and spiritual well-being of visitors. For the elderly and those with dementia, studies have shown herb gardens can help recall comfortable childhood memories, as herbs safely stimulate sight, smell, touch, and taste. Schools are building herb gardens to teach children about where food comes from, what nutrients are, how to cook using herbs, and how to make school food taste better without using chemical additives or a lot of salt. And growing herbs teaches responsibility and nurturing – to say nothing of all the associated lessons with history, math, social studies, and connections with the community through farmers’ markets, etc. The Baton Rouge Unit of the Herb Society of America has already donated $12,500 to this project, but we need your help to complete this valuable community garden. 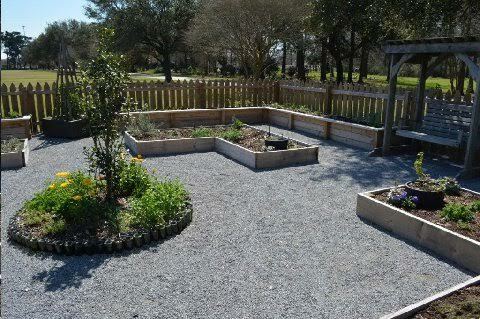 You can donate to the Herb Garden through our website, http://www.hsabr.org/support-hsabr.html, or by sending a check made out to HSABR to our Treasurer, Cathy Scarbrough, 9355 Woodbine St., Baton Rouge, LA 70815. We are a 501(c)(3) non-profit educational organization, so you can deduct your contribution from your taxes. Your contribution will help bring about the completion of this unique historic ethnic teaching and therapeutic garden. Any questions? Contact Mary Williams, 414-526-3016, or druid@wi.rr.com.